Nakano Broadway is a paradise for lovers of anime and manga that is less visited than the busy streets of Akihabara, but no less rich in otaku culture. While being part of a shopping mall benefits the accessibility, the aging building and small stores certainly have accessibility challenges. Nakano Broadway can be found after a short walk north of Nakano Station through the Nakano Sunmall, a covered shopping street with a variety of stores. At the end of Nakano Sunmall, entering Nakano Broadway takes you back in time to a shopping mall from the late 1960s. 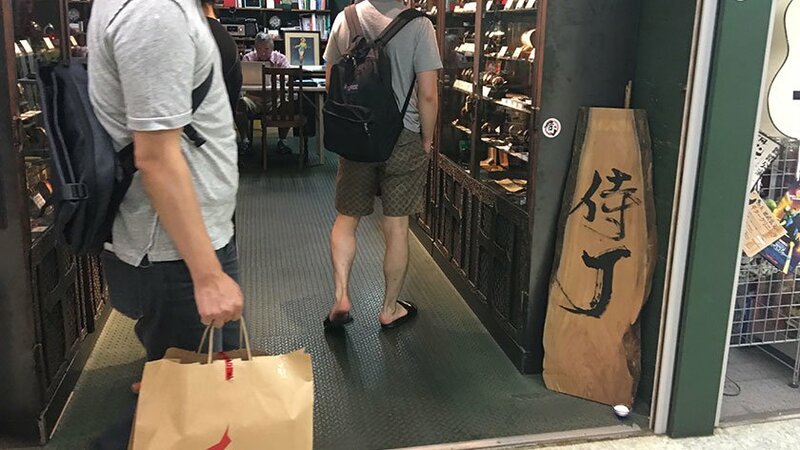 The shopping plaza is is multi-storied with the basement acting as a market place where locals buy groceries, and the ground floor selling clothes, second-hand items, and other various items. The second and third floors are what draw the most foreign visitors as they are almost completely filled with small specialty stores selling all manner of goods related to anime, manga, figures, games, etc. It has a more local vibe than Akihabara and is also more laid back. While it is full of manga and anime, Nakano Broadway does not have any electronics for sale like Akihabara does. 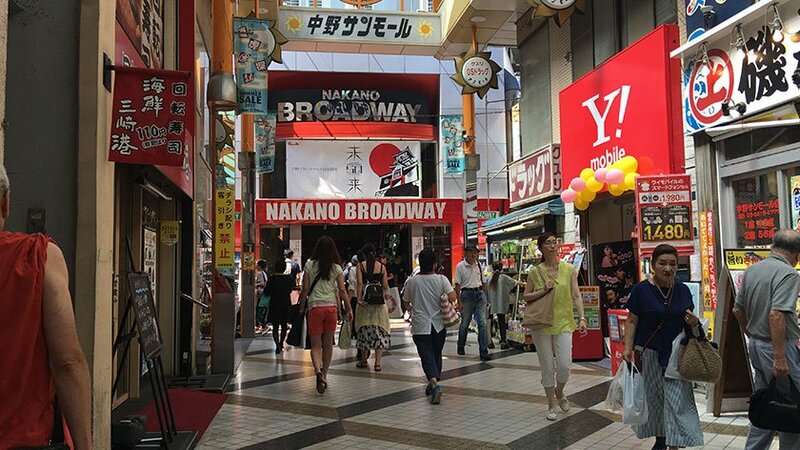 Nakano Broadway is located about 250 meters north of Nakano Station, after passing through Nakano Sunmall. Neither JR Nakano Station nor Tokyo Metro Nakano Station have elevators, so wheelchair users will need to use the adapted escalators (like this) which can be a bit scary. If the escalator is something you want to avoid, it is about a 15-20 minute walk to Nakano Broadway from the neighboring Koenji Station. Since Nakano Broadway was built in the late 1960s, the stores are all small and accessibility was not considered. There are two elevators in the complex – one on the east side, midway down the length of the mall (called “elevator 1”), and another at the far end (called, accordingly, “elevator 2”). Elevator 2 is much larger, but does not stop on the 3rd floor. 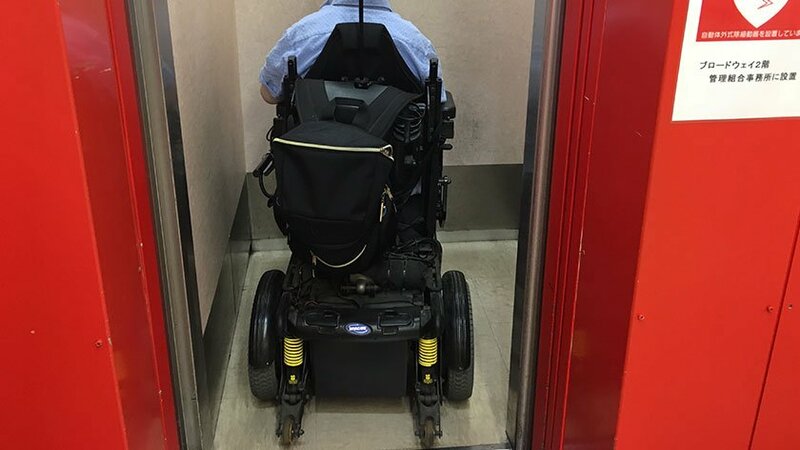 Elevator 1 stops on all floors but is just barely large enough to fit a wheelchair and is often in use. Neither have buttons that are possible to operate without help. …and others are too cramped to get in at all. The vast majority are somewhere in between those two extremes and have a few aisles that are accessible, but a few aisles that are not. Unfortunately, most merchandise is behind glass and it is not possible to take something to the entrance to show a wheelchair user who cannot enter. In that situation, someone could take a picture of an item and show it to the person waiting outside. One aspect of they layout that is much better than Akihabara is the proximity of the stores and lack of steps. 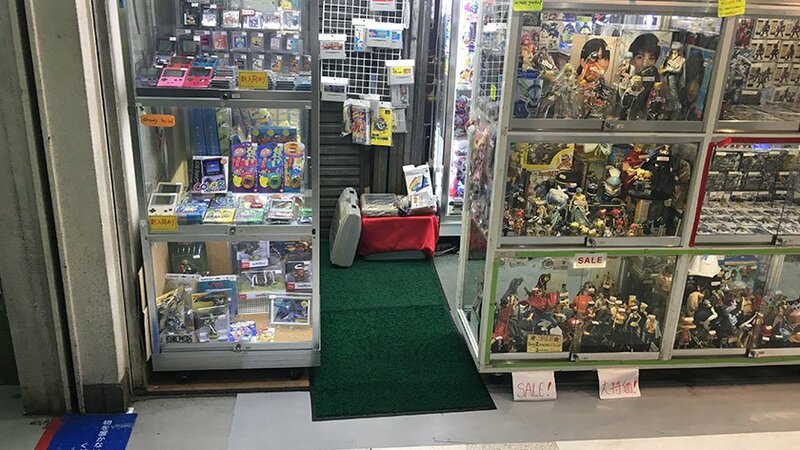 Many stores in Akihabara are spread out and since they are in separate buildings many have stairs and do not have elevators. So, Nakano Broadway guarantees a basic level of accessibility. While there are bathrooms on all floors, none are wheelchair accessible. 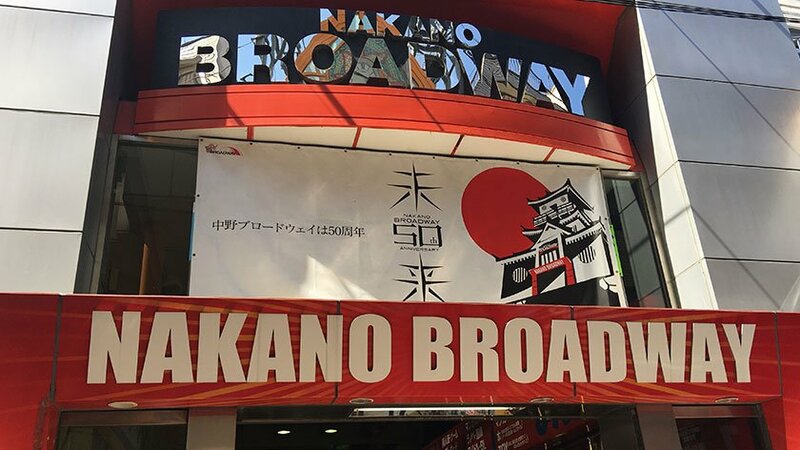 If you love manga and anime, you will want to visit Nakano Broadway. 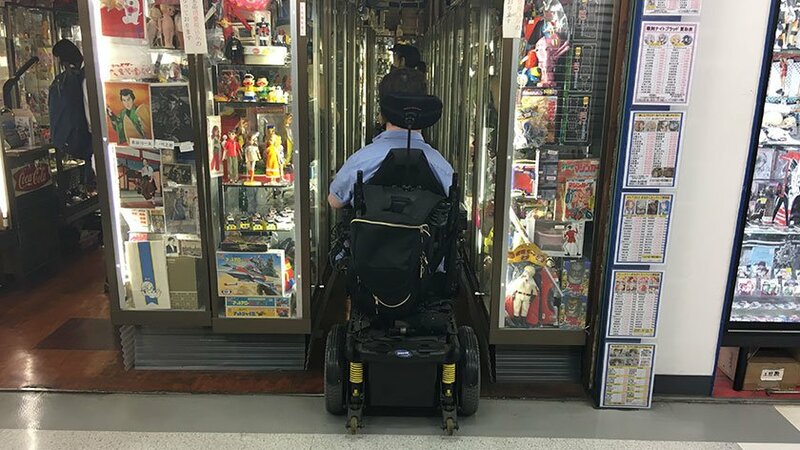 Many stores have some level of accessibility. However, be aware that entering the cramped stores in a wheelchair may be difficult or impossible. The aging building is also inconvenient due to poor elevators and lack of accessible toilets.